Kashmiri Muslims carry the body of Burhan Wani, a separatist militant leader, during his funeral in Tral, south of Srinagar (July 9, 2016). Burhan Muzaffar Wani’s death has sparked the Kashmiri tinder box. What happens now? While Indian Prime Minister Narendra Modi was on a tour to Africa, Indian troops back in Kashmir were shooting at peaceful demonstrators who were out on streets after the killing of a popular rebel commander. In five days, 36 civilians have been killed by Indian forces and more than 1,500 injured, including 100 with eye injuries. A medical emergency has been declared while the Kashmir Valley remains under curfew. 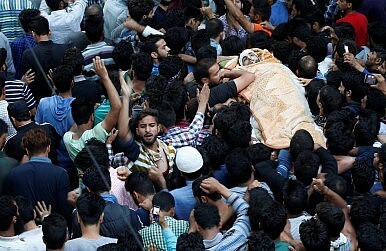 Six years after he chose to take up arms against the state, Burhan Muzaffar Wani, 22, was shot dead by a joint party of Indian army and police in a brief gunfight in South Kashmir. Wani was a militant commander of Hizbul Mujahideen – an indigenous rebel outfit fighting for an independent Kashmir, designated as a terrorist group by the government of India, on a list of “Other Terrorist Groups” by the United States, in addition to the European Union. Over time, Wani, who had a $1,500 bounty on him, had become the face of the new-age militancy that emerged after the 2010 mass uprising, in which 120 civilians were killed by Indian troops. During the uprising, tens of thousands of civilians, mostly young people, were arrested and tortured, which led to the further strengthening of anti-India sentiment. Like Wani, many other youth chose to become militants without crossing over the de facto border—the Line of Control—to Pakistan-administered Kashmir for arms training. United Nations chief Ban Ki-moon called for “maximum restraint” to avoid further violence and hoped that all concerns would be addressed through peaceful means. “The Secretary-General is closely following the recent clashes in Kashmir. He regrets the reported loss of dozens of lives and the injuries to many others,” a statement issued by Ban’s spokesperson said. Wani vehemently used social media and even shared video messages to attract local support for new-age militancy and to recruit more local militants. According to the government, around 180 militants are currently operating in Kashmir Valley, a majority of them locals. Infiltration across the LOC has also increased in the recent months, but local militants continue to outnumber foreigners. Wani’s symbolism and poster-boy popularity attracted scores of youth, mainly in South Kashmir, to join him. Even peaceful protesters would flash banners containing Wani’s gun-wielding pictures. Observers have noted that with absence of any political steps toward resolving the Kashmir dispute, the growing anti-India sentiment has led to a rise in new-age militancy. Since Wani’s killing, the situation in Kashmir has again turned from perceived normalcy to amplified instability, cracking the perception of “peace returns” with tens of thousands of people endorsing militancy. At Wani’s funeral on Saturday, nearly 200,000 people—some even from remote areas of the Valley—gathered to mourn the “hero of the freedom movement.” Half a dozen active militants joined the funeral procession and fired off a 21-gun salute. On Saturday, the government imposed a strict curfew, dotting the National Highway that leads to Wani’s hometown of Tral, 30 miles south of the state capital, Srinagar, with barricades. Demonstrations and stone throwing have not stopped since the news of his death went viral. Mobile Internet was shut off immediately in all of Kashmir and phone services continue to be shut down in South Kashmir. Without using non-lethal weapons or showing restraint, Indian troops opened fire at civilians, killing 36 within five days. Two hospitals in Srinagar are filled with the injured. At one hospital, more than 100 civilians who have received pellet injuries will possibly lose their eyesight. Condemning the use of force against demonstrators, the South Asia director of Human Rights Watch, Meenakshi Ganguly, said that stone throwing at demonstrations is serious, but does not provide police with a free pass to use force against protesters. Two dozen ambulances have been attacked by the troops on roads, and the doctors have been instructed not to share any details to the media. But this doctor says that from a human angle it is very painful to see the magnitude of the problem. Outside the SMHS hospital in Srinagar, where patients with eye injuries are treated, hundreds of people wait to receive the injured. People have set up community kitchens at the two major hospitals in Srinagar and volunteers are helping the injured. Reluctantly covering the damage troops caused by firing live bullets and pellets, Indian electronic media is connecting the spontaneous demonstrations with Pakistan—enraging ordinary people on streets of Kashmir. The chief minister, Mehbooba Mufti, called for normalcy in a video message. She appealed to all of Kashmiri society, parents in particular, to help stop the protests, but only after the damage was done. The ruling People’s Democratic Party’s leader and youth president, Waheed Ur Rehman Para, says that all those who are engaged in this violence are mostly teenagers, so the responsibility for reining them in rests on society. What has led Kashmir’s children to come out on the streets is the state violence and the failure of political engagement. In his death, Wani has become an even more popular leader, whose tempting aura will amplify the people’s struggle against India. Wani’s death has moved the people of Kashmir far more than his actions in life. The number of people attending his funeral and the spontaneous demonstrations dotting the Valley prove this. These uprisings in Kashmir always have been seen as a law and order problem. But popular sentiment among the people fuels the anti-India rage that erupts in large demonstrations after every significant incident. Wani’s killing fanned the rage leading into the current crisis, proving that peace in Kashmir can only return by listening to people’s demands to exercise their right to self-determination. India’s reaction to this uprising and many in past has been to blame Pakistan. A minister of the Indian government accused Pakistan of interfering into India’s internal affairs. Kiren Rijiju, the union minister of state for home affairs, said, “[Pakistan] should worry [more] about human rights violations in Pakistan-occupied Kashmir than Jammu and Kashmir. Kashmir is an internal matter of India.” Additional troops were also sent to Kashmir, with New Delhi seeing the problem as a law and order issue, and ignoring the deep rooted political aspirations of the people. In the 2010 uprising, the Indian government sent a three-member team to assess the situation, but their report also didn’t address the deeper political issues. India’s failure to address Kashmir’s political problem, while people only resorted to peaceful protests, has led to this new anger. This new generation of youth taking to the streets, different than any in past, will be committed to defying restrictions and facing the Indian soldiers’ bullets to make a political statement. Violence begets violence and soon many young boys may be inspired to follow in Wani’s path, seeking to lead Kashmir to a new political reality. This is only the latest attempt by radical groups to destabilize talks between Delhi and Islamabad. Will they succeed?